Changing the culture of a high school requires both strong academic leadership and broader community support dedicated to college success. Getting the steps right about implementing changes to school culture matters a lot, especially when a significant segment of the school’s student population needs extra support to be college ready. The experience of Worcester South High Community School in raising the expectations for student success, and getting the details of implementation right, is a useful model for understanding school-wide improvement in an urban high school setting and for showing how a program like MIE’s AP STEM and English program can spark school-level, perhaps even district-level, change. Here is how they did it. Prior to joining MIE’s Advanced Placement (AP) STEM and English program, Worcester South’s low AP participation and success rates mirrored those seen in other Massachusetts urban high schools serving predominately low-income students, where only approximately 20 percent of students take an AP course as a junior or senior and less than 10 percent of students score a three or above on an AP exam. Things began to change in 2009 when Worcester South joined MIE’s AP STEM and English program and administrators and teachers began implementing key components of the program including intensive training for AP teachers, opening access to AP courses to all students and actively recruiting students for AP courses. With the adoption of new practices, a significantly greater number of Worcester South’s students began to take AP course and achieve a qualifying score of three or better on AP exams. But not all of the school’s students were participating in the expanded AP program. A close analysis by the “designated administrator” – MIE’s primary contact at the school – and the school’s guidance counselor of the growing number of students enrolling in the AP courses uncovered a very significant challenge. AP participation by Latino students – which in the 2014-2015 school year represented 43.3 percent of the school’s enrollment – was not growing. Even after two years in the program, the percent of Latino students taking AP courses had not increased. 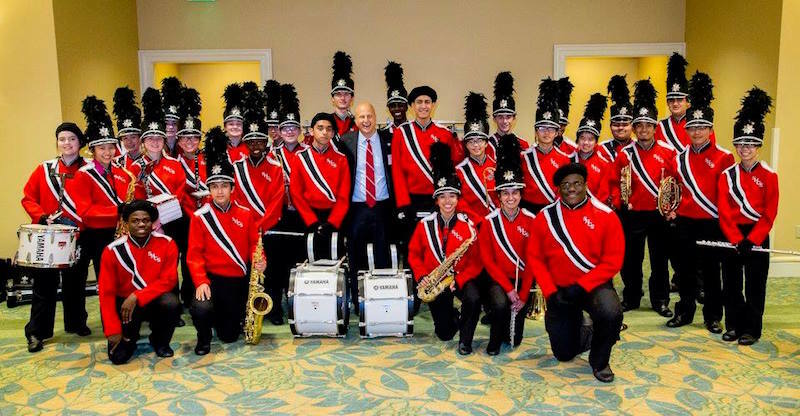 Worcester South’s band gave a fantastic performance at our 2016 Partners in Excellence Award celebration. Here they are with our keynote speaker, Eric Waldo, First Lady Michelle Obama’s Reach Higher initiative. Reversing this troubling trend required both new thinking about how to engage and support Latino students and staff-level leadership rising to the challenge both in the school and the community. In this case, Worcester South’s guidance counselor, with the support of the school’s principal, spearheaded several key and proactive initiatives, including:. Planning began with the formation of a committee charged with exploring why Latinos were not enrolling in AP courses. With strong support from the principal, the guidance counselor formed a committee and invited all interested staff and administrators to participate. To build a greater sense of shared responsibility for helping Latino students succeed, the guidance counselor reached out to the business community, the broader Latino community, local colleges (Clark and Worcester State universities are nearby), and former Latino AP students. The committee – which named itself Latinos Excelling in Advanced Placement, or LEAP – included multiple stakeholders and was used as a forum to brainstorm ideas and strategies for improving AP participation. LEAP got to work examining the transcripts for each Latino student, looking for trends in course taking patterns and identifying students with potential. The guidance counselor soon discovered that a lack of confidence was the key reason keeping Latino students from enrolling in AP. She encouraged Latino students to enroll in AP Spanish and AP Spanish Literature (a new AP course, specifically offered as a result of this work), to show students that they could indeed succeed in AP courses. Many of these students subsequently enrolled in AP math, science and English courses. The guidance counselor and AP teachers met with parents and students at Worcester South’s feeder middle schools, conducting the sessions in Spanish and translating into Spanish AP information material from the College Board and MIE. These sessions increased awareness of AP courses and how they helped in college success, and stressed to parents the information they needed to know to make sure their students were on track to take these courses. Worcester South also recruited current Latino AP students to visit local middle schools to tutor students and serve as role models. Both the guidance counselor and principal also shared information on AP courses at local churches, many of them Spanish speaking. Too often, school leaders overlook these important institutions as a vehicle to engage the community and support school improvement strategies. In Worcester, the local churches helped to build the social capital that contributed to the program’s success. Worcester South also created a separate study session for English Language Learners (ELL) interested in taking AP courses. This sent an important message to ELL students: Worcester South’s faculty and staff truly believed that Latino students, even those still identified as ELL, were expected to take AP courses. Worcester South holds an annual all-school AP recruiting fair, complete with signs, slogans and activities, to promote enrollment in AP courses and sponsors an AP club for AP students to build comradery. Thanks to these initiatives, the number of Latino juniors and seniors taking at least one AP course more than doubled from 2009-2010 (the first year of program impact), when 18 students took an AP class to 2014-2015, when 37 students took an AP class. The changes to school culture implemented by Worcester South did not just stop with boosting participation in the AP program, however. There also was a dramatic improvement in students’ MCAS scores in English and STEM classes for all students and Latino students in particular.